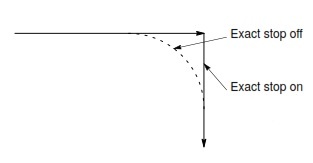 G09 Exact Stop or Precision Cornering G code decelerates the axes to zero velocity at the end of the block in which it is programmed. After stopping, the axes accelerate to the programmed feedrate in the next block. This causes a sharp corner to be cut regardless of the programmed feedrate. The G09 code is non modal G code, so it affects only the axis movement of the block in which it is specified. G09 Exact stop G code is and should only be used whenever cnc machinists want to cut sharp corners while machining. There is no other use for this G09 g code. Precision cornering can be achieved at any place whether you are grooving,turning or milling, Just program G09 Exact stop G code in the line of cnc program where you want to achieve sharp corner. The feed of axis will slowly decrease to zero and then again it will increase to full programmed feed. This whole process is just that fast that you can’t even observe it with your eye. This feed deceleration and acceleration process will not affect component finish at all. So you will not observe any poor machining at all.